Special 3-2 is the second level of Special 3 in Super Mario 3D Land. It is based off World 4-3. 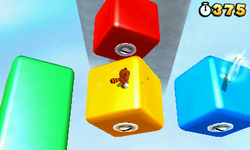 The player starts out on a grassy platform and must use a Rubber Platform to jump onto some Rotating Blocks before reaching another grassy platform. On this platform there is a Flying Question Block that the player can jump on to reach a higher area that contains two ? Blocks, one with a Coin and the other with a Statue Leaf. The player must then jump onto some more Rotating Blocks before reaching a small grassy platform that the player must use to jump onto some more Rotating Blocks that lead to another platform. The player will then need to jump onto some more Rotating Blocks that lead to another grassy platform. This platform contains the Checkpoint Flag and several Piranha Plants. The player then needs to use a Rubber Platform to reach a higher area of the grassy platform that leads to more Rotating Blocks. The player needs to jump onto the Rotating Blocks and they will eventually lead to the Goal Pole. Star Medal 1: On a blue Rotating Block after the second grass platform. Star Medal 2: Floating in the air near the Checkpoint Flag, the player will need to use a Rubber Platform to get to it. Star Medal 3: Floating above a red Rotating Block near the end of the level. This page was last edited on April 15, 2019, at 15:28.